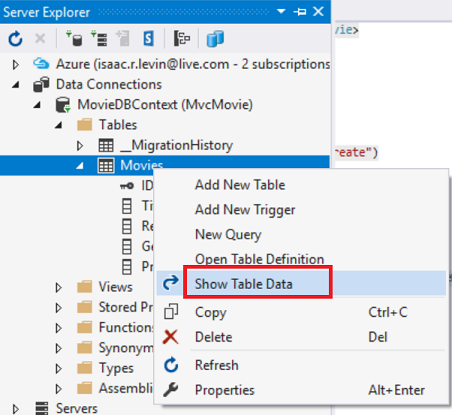 In this section, you'll create a new MoviesController class and write code that retrieves the movie data and displays it in the browser using a view template. Build the application before going on to the next step. 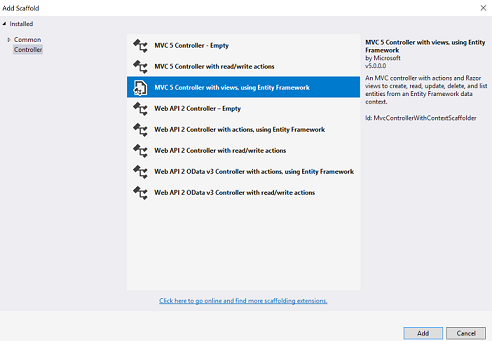 If you don't build the application, you'll get an error adding a controller. A MoviesController.cs file in the Controllers folder. Create.cshtml, Delete.cshtml, Details.cshtml, Edit.cshtml, and Index.cshtml in the new Views\Movies folder. 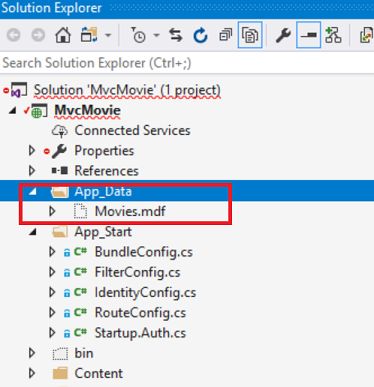 Run the application and click on the MVC Movie link (or browse to the Movies controller by appending /Movies to the URL in the address bar of your browser). Because the application is relying on the default routing (defined in the App_Start\RouteConfig.cs file), the browser request http://localhost:xxxxx/Movies is routed to the default Index action method of the Movies controller. In other words, the browser request http://localhost:xxxxx/Movies is effectively the same as the browser request http://localhost:xxxxx/Movies/Index. The result is an empty list of movies, because you haven't added any yet. 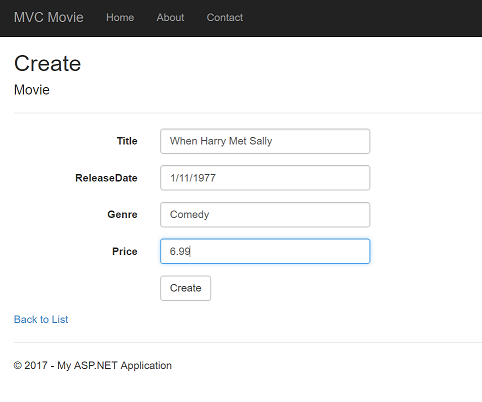 Clicking the Create button causes the form to be posted to the server, where the movie information is saved in the database. You're then redirected to the /Movies URL, where you can see the newly created movie in the listing. 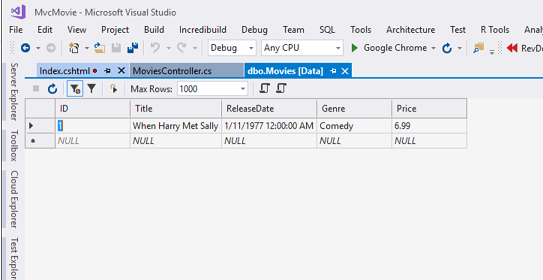 Open the Controllers\MoviesController.cs file and examine the generated Index method. A portion of the movie controller with the Index method is shown below. 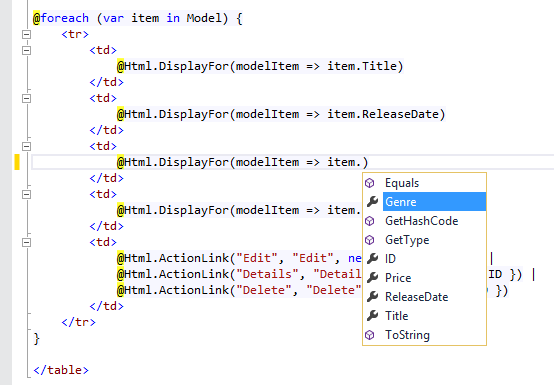 In the Controllers\MoviesController.cs file examine the generated Details method. The Details method is shown below. 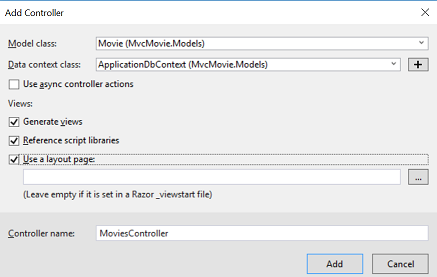 This @model directive allows you to access the movie that the controller passed to the view by using a Model object that's strongly typed. For example, in the Details.cshtml template, the code passes each movie field to the DisplayNameFor and DisplayFor HTML Helpers with the strongly typed Model object. 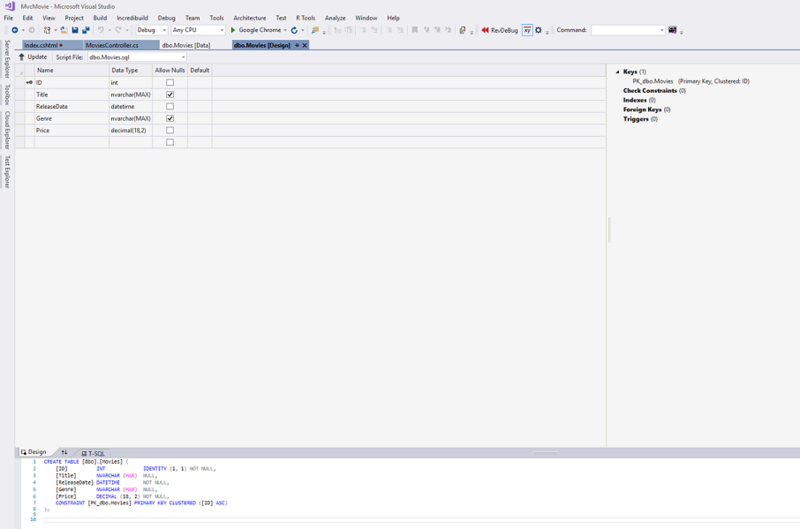 The Create and Edit methods and view templates also pass a movie model object. 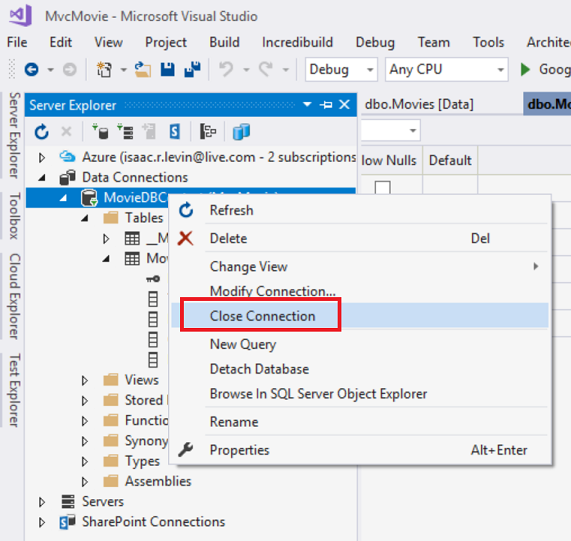 Entity Framework Code First detected that the database connection string that was provided pointed to a Movies database that didn't exist yet, so Code First created the database automatically. You can verify that it's been created by looking in the App_Data folder. 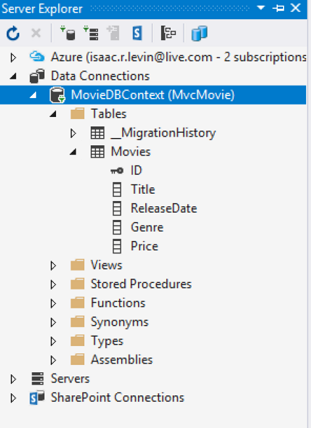 If you don't see the Movies.mdf file, click the Show All Files button in the Solution Explorer toolbar, click the Refresh button, and then expand the App_Data folder. 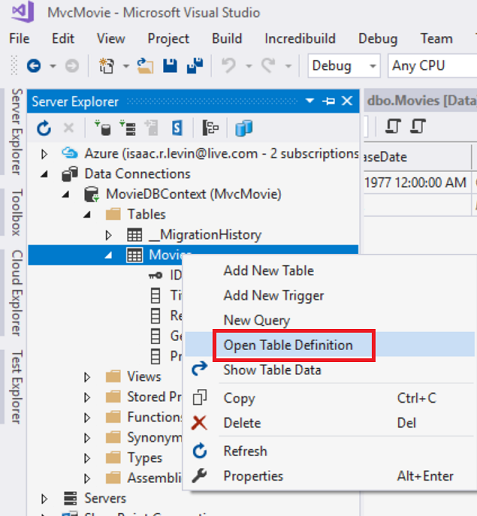 Double-click Movies.mdf to open SERVER EXPLORER, then expand the Tables folder to see the Movies table. Note the key icon next to ID. By default, EF will make a property named ID the primary key. 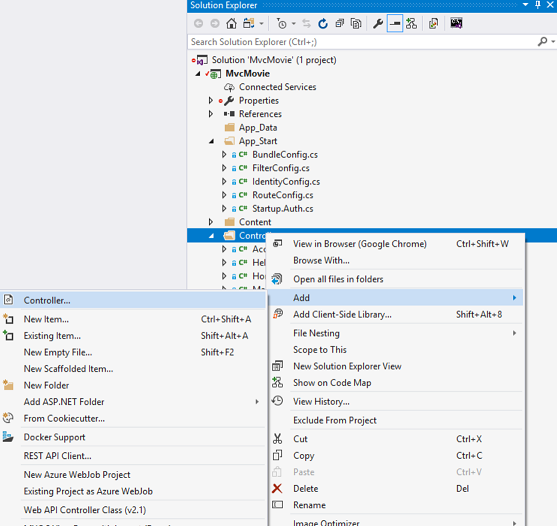 For more information on EF and MVC, see Tom Dykstra's excellent tutorial on MVC and EF.